Foil Backed Fiberglass Pipe Wrap Insulation is a 1" thick fiberglass blanket laminated with a reflective foil facing. The pipe wrap is 3" wide and 25 ft long and can be spiral wrapped around any size pipe to provide a R-Value of 3.7. Matching foil tape (sold separately) is used to seal the sections together for an air tight barrier. Foil Backed Fiberglass Pipe Wrap Insulation is used commonly over small Pipe Heating Cables or around valves and other hard to insulate pipe fittings. Great for under sink piping! The foil facing provides a reflective barrier which helps retain radiant heat from pipe heating cables. 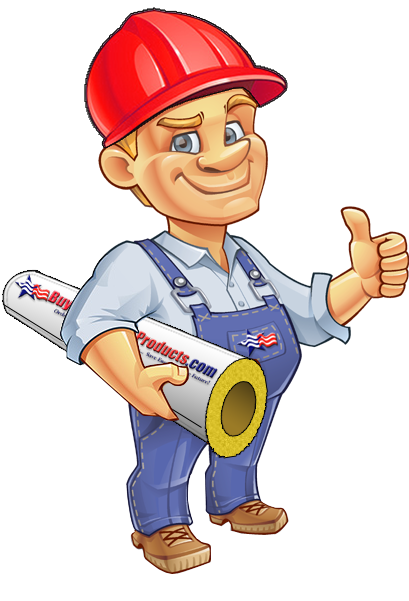 Unlike conventional pipe wraps which are only 1/2" thick, this foil-faced insulation wrap is 1" thick which provides an R-3.3. *Rolls are compressed for packaging, open rolls and allow fiberglass to recover thickness. When installing make sure not to compress fiberglass by wrapping too tightly. *Manufactured by Wrap-On or Thermwell Products. *You may also be interested in our Fiberglass Pipe Insulation products. Click the button below to add the Foil Faced Fiberglass Pipe Wrap (1" Thick) to your wish list.